Welding Manipulators are designed to move the weld head over the workpiece. Redrock Automation stock and supply various pipe stands and additional pipe stands supports capable of handling various loads. Each provides easy width adjustments to support any width of pipes. Manual operation or gear powered… Low height, tall or adjustable… All our pipe stands can be adjusted to suit multiple diameters of pipe. In addition to our pipe stands range, we also supply additional pipe stand supports. 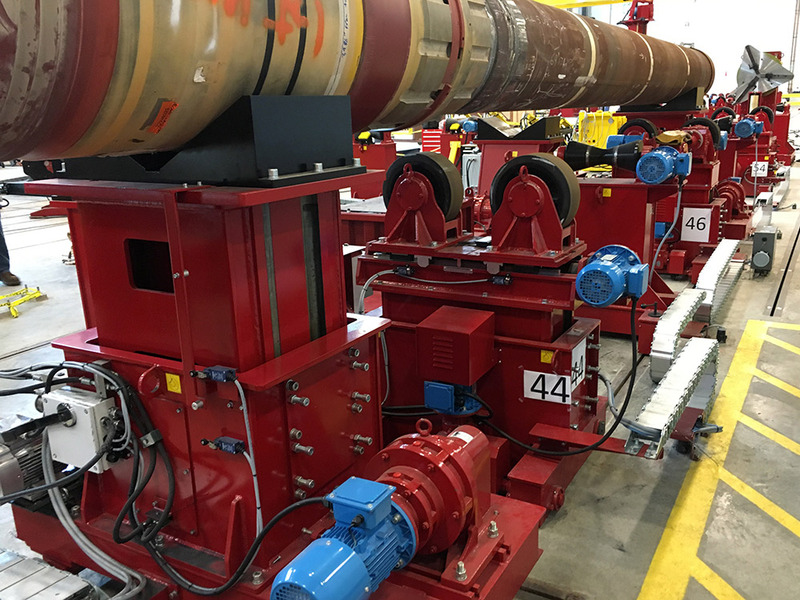 These are often used alongside a weld manipulator to support longer length pipe being rotated with a column and boom or other type of positioner and headstock applications. Robustly built with solid steel and engineered for maximum stability while providing a smooth rolling motion. Pipe stands and pipe stands supports for any weld automation can be catered to. Redrock Automation are a global brand and trusted supplier of weld automation equipment to clients around the globe. Our team are highly skilled, easy to communicate with and great at designing equipment to solve weld production productions. We have the expertise and 100,000 square feet of factory space and distribution depots located in key destinations including the Netherlands, Germany, France, Spain, UAE and Saudi Arabia. Wherever you need us, we can meet you where you are, consult, design, supply, service and maintain any setup you need. Our expertise is in the manufacturing and supply of Welding Rotators, Welding Positioners and Welding Manipulators. Our ambition is to become a global ONE STOP SHOP of turnkey weld automation systems.